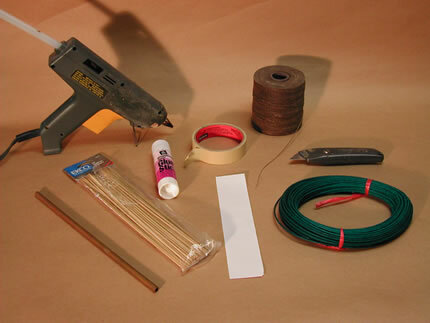 How To Make a Rocket With Visco Fuse — Skylighter, Inc.
A while back I received samples of some of Skylighter's fabulous Chinese-made fireworks fuse products: fast yellow visco, green visco, thin (cross-match) visco, and paper firecracker fuse. Noting the substantial flame spit from the visco fuse, I decided to try making some simple miniature rockets using the normal green visco fuse. As hoped, the rockets worked great, were lots of fun, and requiring no special tools, were extremely easy to make. The rocket engine is roughly the size of a common bottle rocket and if carefully made will go a hundred feet or more in the air. Here's how to make the basic model. Cut six pieces of visco fuse, each 1-inch long (Skylighter Chinese green visco must be used; American made visco does not have the necessary burn characteristics). With the tape sticky side up and oriented vertically on the work table in front of you, place the 2-1/2 inch long piece of visco perpendicular to the tape, about 1/4-inch up from the bottom edge, with the left end of the visco aligned with the left edge of the tape, forming an "L" shape. Stick the six 1-inch pieces of visco fuse down onto the tape just above the 2-1/2 inch piece. These pieces should also align with the left edge of the tape and just reach to the right hand side if they have been cut to the correct length. The pieces of visco should be touching each other. Fold the bottom 1/4-inch flap of tape up over the pieces of fuse, and continue rolling up the tape/fuse combination as tightly as possible. When done correctly, the end result will be a long piece of visco surrounded by six short pieces of visco, tightly bundled together and held by the tape. On one end of the bundle, all fuse ends will be exactly even and on the other end, the six short pieces will be even, with the longer visco piece protruding 1-1/2 inches. It will look like a tiny cartoon version of a bundle of dynamite. This may take a bit of practice to get a nice tight roll, which is important for good rocket performance. From a piece of typing paper, cut a strip 1-3/4 inches by 8-1/2 inches, and lay the strip on the worktable vertically. 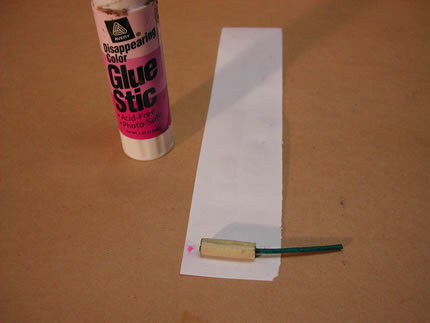 Apply glue from the glue stick to the entire surface. 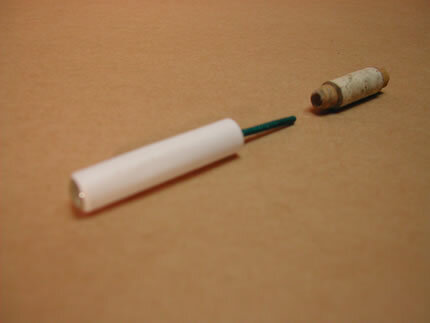 Just a quick coat will do; it is not necessary to be very thorough with the glue application, except at each end. Place the fuse/tape bundle at the bottom of the paper strip, in preparation for rolling up the engine casing. Place the end of the fuse bundle with all fuse ends being even, 1/4-inch in from the left side of the paper strip. Carefully, and as tightly as possible, roll up the visco fuse bundle in the paper strip. If done correctly, the result will be a small rocket engine with a 1/4-inch deep cavity at one end and a 1/2-inch deep cavity at the other end, with a piece of visco fuse sticking out. 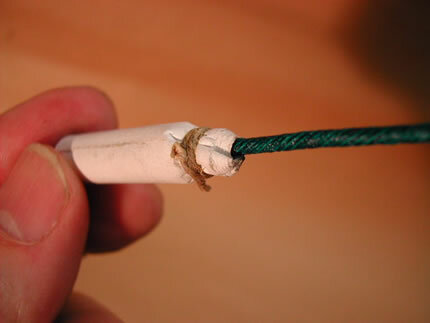 The fuse bundle should sit securely and should not be able to slide out of the paper casing. Set aside for a few minutes to dry. Completely fill the 1/4-inch cavity with hot melt adhesive. Let cool. Choke down the 1/2-inch cavity end of the tube around the protruding single piece of visco fuse, using the string to constrict the tube. 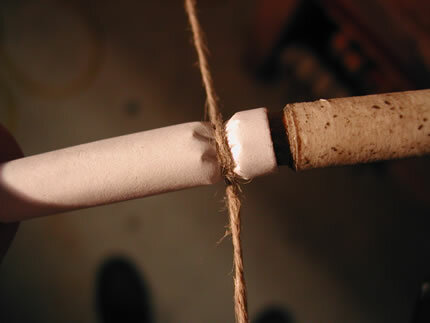 A clove hitch and a few extra turns of string are applied to form and maintain the choke tightly around the visco fuse; this completes the rocket engine. Static test an engine first by poking an engine headfirst into the ground and lighting it. It should burn nicely for several seconds. The nozzle end should not burn through or burn off. If it does, the paper is probably too thin and you may need a few extra turns. After determining that there is no burn through and that your construction technique is sound, attach a 7-inch long bamboo skewer to the side of another completed engine with hot melt. 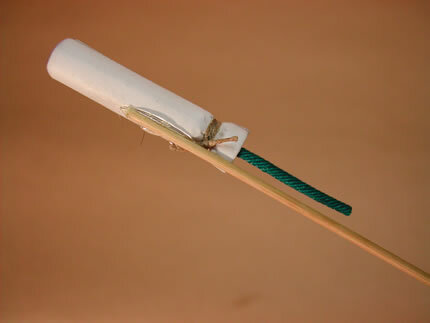 To save weight and make your rocket fly higher, the skewer should first be split lengthwise with a sharp utility knife. 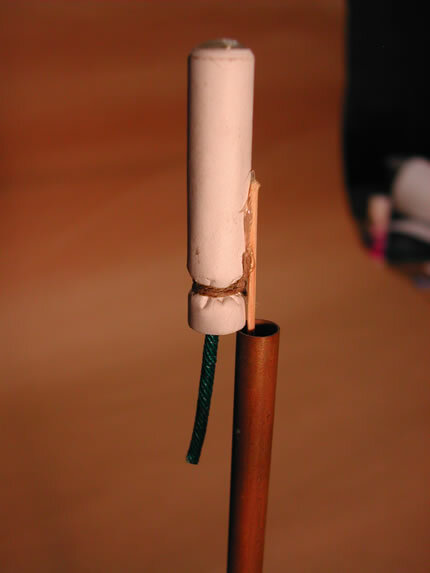 The end of the skewer should be about 1/3 of the way down from the glue-filled cavity end of the rocket engine (which means that the fuse points down the length of the skewer). To launch your miniature rocket, place the thin-wall tubing approximately 3 inches into the ground so that the tube is stable, and pointing straight up or at a very slight angle. Place the rocket in the tube, light, and enjoy! 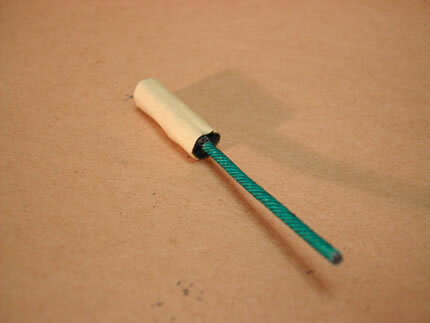 A very nicely crimped nozzle can be made using the 5/16-inch diameter X 1-inch long wooden dowel. First drill a 1/8-inch diameter centered hole from one end of the dowel all the way through to the other. Round over one end to the dowel just slightly and check to see if it slides down over the visco fuse and into the 1/2-inch cavity on the rocket engine. 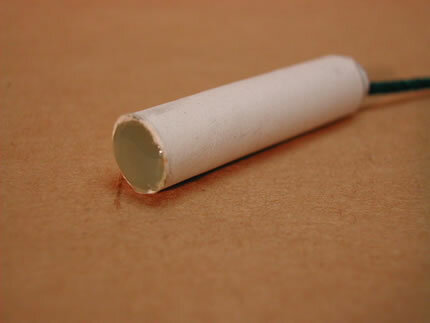 Wrap some tape around the dowel, back about 3/8-inch from the rounded end. 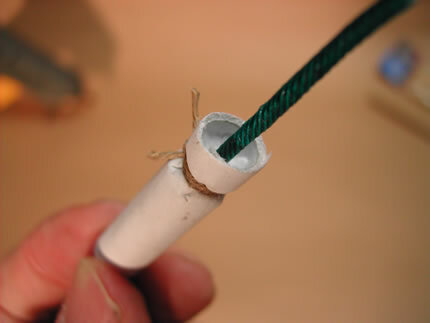 This acts as a stop collar to prevent the dowel from bottoming out in the cavity, so make sure there is space between the end of the dowel and the six short pieces of visco fuse for tying the string. Now secure the string around a stationary object. 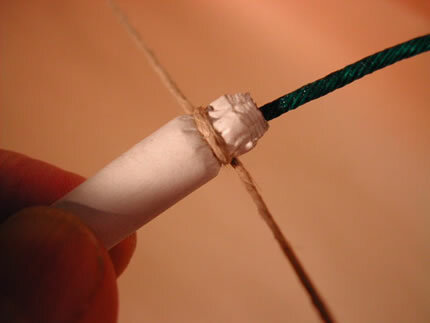 Wrap the string around the rocket engine tube to be crimped and apply pressure with the string and with the dowel in place. Rolling the engine back and forth as pressure is slowly applied produces a beautifully crimped nozzle. Secure crimped area with string. 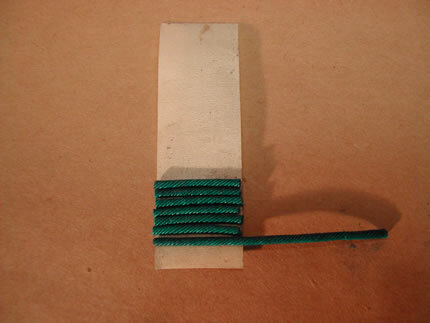 This method of making a crimped choke is described more thoroughly in Weingart or Lancaster. Longer flight duration can be obtained by using wider masking tape and correspondingly longer visco fuse. Before rolling up the fuse in the tape, sprinkle in small amounts of titanium (any of them) for some silver spark trails. Q: Can I use any other of Skylighter's visco fuses to make these sky rockets? A: I have used colored flying fish fuse and crackling flying fish fuses. The crackling makes a neat crackle when it rises. I have not had good luck using the fast yellow visco fuse with engines, as it burns too fast. Q: This method seems like it could lend itself to making all sorts of miniature fireworks for us pyros who have very limited work areas? A: Correct! It avoids any messy mixing, requires almost no tools, is safe and won't annoy the neighbors. Brass tubing, 1/4" I.D. x 12"